The ios version of Dashlane provides it’s own browser, but if you use bookmarks in Safari a lot like I do, you probably don’t/won’t use Dashlane’s browser very often. To date Dashlane’s browser doesn’t offer bookmarking, although I’ve been told by customer support they are working on this. The solution was installing a bookmarklet in Safari for Dashlane. It was an easy way for ios users to open a link in Safari via a bookmarklet…if you could get the bookmarklet itself installed. But bookmarklets are a little cumbersome and confusing to setup for many users, and I suspect they aren’t widely used for that reason. Just to be clear, this limitation existed because of Apple’s restrictions, not Dashlanes. No app, prior to ios 8 had a better alternative than bookmarklets. But ios 8 is all about connectivity, and many of the newest features provide great choices for users to implement. One exceptional new feature is technically referred to as the Share Extension in Safari. 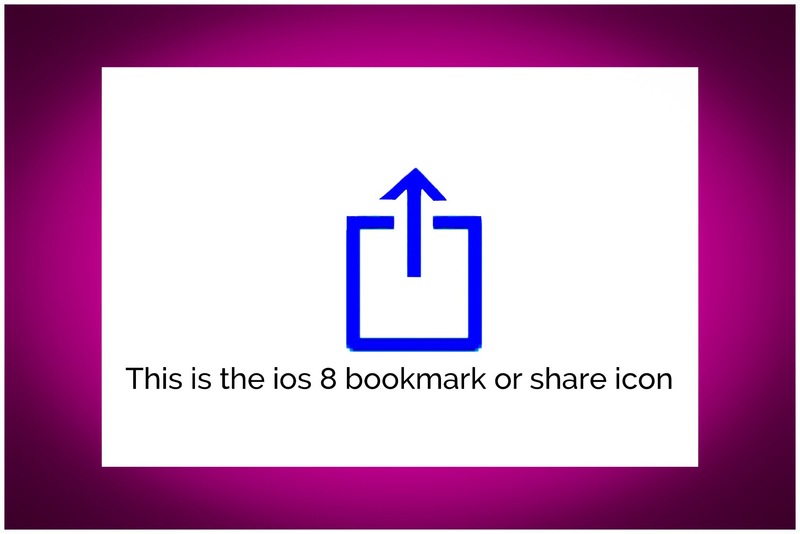 What’s an ios 8 Share Extension? 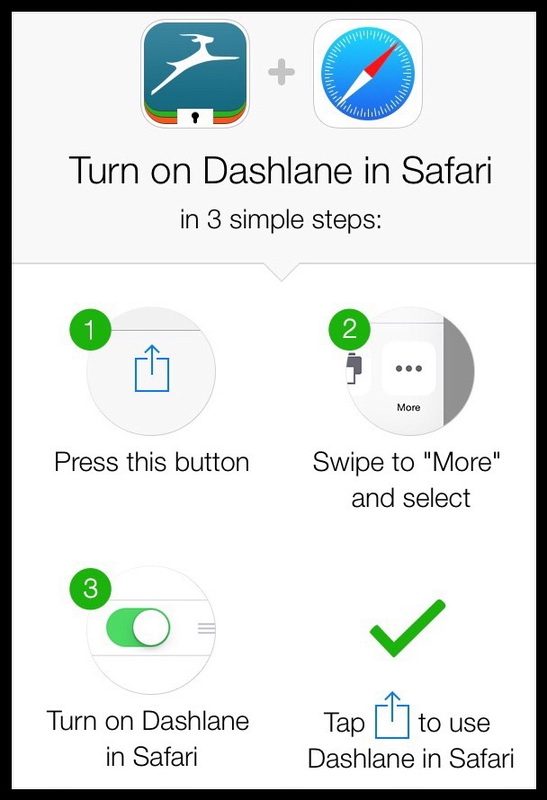 Apple’s new Share Extension feature is quickly being incorporated into some of the best ios apps, including Dashlane and Evernote. When you’re using Safari, immediately to the right of the URL/Search box, you should see an icon that looks like the one below. The first step is to open the Dashlane app and then go to the settings menu to tap on ‘Turn on Safari Extenion‘. To get to settings in the Dashlane App, tap on the three lines in the top left corner when the app opens, and then tap on the gear icon just to the right of it. When you’re in Safari and you land a webpage that requires signin credentials that you’ve stored in Dashlane, just tap on the Share icon in the upper right hand corner, then swipe across the second grey tier of icons until you reveal Dashlane, and tap on it. A tiny version of the Dashlane PIN Code keyboard will appear (if you’ve setup a PIN to use with Dashlane, otherwise I suspect it will ask you to enter your master password). 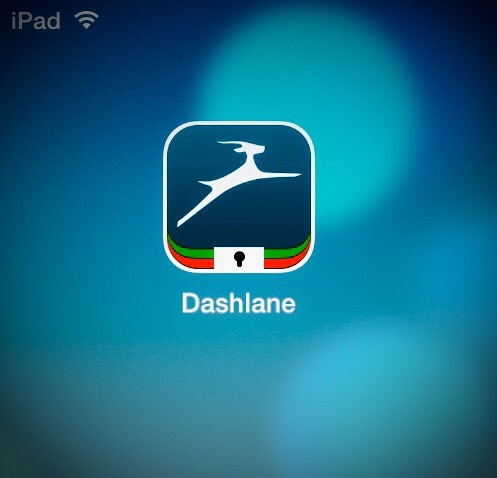 Once you verify your authenticity to Dashlane, the app will autofill an account’s signin credentials right inside Safari! It’s really a simple and elegant solution which I think removes any remaining barriers preventing wider scale adoption of Dashlane. The speed with which Dashlane’s adopted features of ios 8 to benefits it’s users confirms Dashlane was the right choice for me to make 6 months ago. They really are the ‘leader the pack’ of top tier password managers on mobile devices! If you have any comments or questions you can ask or leave them in the comment area below. I don’t have a mailing list, or use email addresses in any way. Nor will your email address be collected, used, or sold. It’s optional for leaving a comment, but necessary if you’d like me to personally respond to your question or comment.